Cette maison de vacances idéalement située sur Surf Parade, Inverloch, se trouve en face de la plage de surf principale et à 2 minutes en voiture de la ville. Composée de 3 chambres dont 2 avec salle de bains et une troisième salle de bains desservant la troisième chambre avec baignoire, douche et vasque et des toilettes séparées. Le linge contient une machine à laver et un sèche-linge. Toutes les salles de bains ont été entièrement rénovées et sont de qualité 5 étoiles avec carrelage du sol au plafond, de magnifiques murs en bois, des douches à l'italienne et de grandes vasques. C'est la location de vacances idéale à Inverloch pour un week-end, des vacances scolaires ou un été au soleil. Capacité d'accueil 6 personnes, comprenant deux lits Queen size et deux lits simples. Jennie’s house is perfect for a family get away. Opposite the beach, close to the bike path, very comfortable & well presented. The heating in the living area was very cosy for our winter get away. The bathrooms are all recently renovated & lovely. The garden was perfect for our small dog with dog proof fencing & great deck off the main doors. Highly recommended. Had a fabulous stay with friends, the house easily accommodated two families. Great kid and dog friendly property. Position is perfect, a walk to town and straight over the road from the beach. The property hosts were fantastic with communication - Thanks guys we will be back! Despite being pet friendly, the house was clean and tidy. 60 seconds and you are on the beach. Kids did surf lessons. The dog could definitely live there, what a great beach. Had a parma & pot at the Inlet, and pies from paul the piemans - both were super. NIce winter getaway. Highly recommended. The house was very comfortable, very tastefully decorated, and the location just across the road from the beach was fantastic. We really enjoyed the sound of the surf, and walks along the beach. 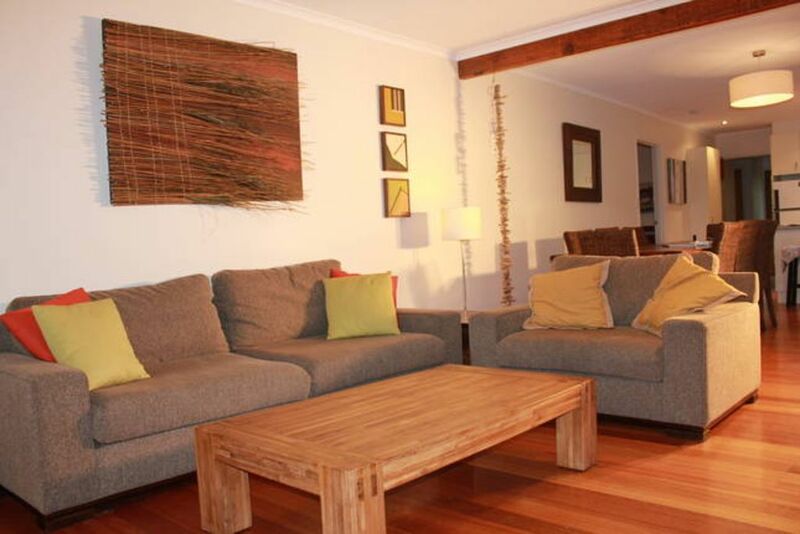 It was conveniently located near the township of Inverloch. There is an interesting collection of books to browse and games such as Scrabble. My family & I where very happy with the location & set up of the house. We have a 18 month old daughter & it's a great child friendly house. Super warm & comfortable. The bathrooms are fantastic so clean & moden. Thank you for a fantastic beach side holiday we will be back. We enjoyed our stay here. Great location - beach is across the road ,through the tea-tree. Great bathrooms and nicely furnished. The place needed a good spring clean, though. Maybe it's hard to avoid with a pet friendly place, but the couch smelt 'doggy', also the floors needed a good sweep. Good communication from the owner before and during our stay. Thanks for your feedback. The location is truly great and as you know the bathrooms are beautiful. Thanks for bringing our attention to the 'doggy' smell of the couch. We have since had the sofa and armchair professionally steam cleaned to address this. We hope you will consider staying again.